The final three months of 1976 were chopped full of action and historical moments as Jim Crockett Promotions moved towards the New Year of 1977. October saw an amazing night of action happen in the Greensboro Coliseum on October 16, 1976 where three major titles changed hands on the same card. Perhaps the most noteworthy of these changes was Paul Jones defeating Blackjack Mulligan for the United States Heavyweight Title, breaking Mulligan’s seven month stranglehold on that title. October also saw the first signs of a developing feud between NWA Tag Team Champions Gene and Ole Anderson and the new dynamic team of Ric Flair and Greg Valentine. This feud would start in 1976, but would last through all of 1977. The month of November started with the crowning of new Mid-Atlantic Tag Team Champions, Dino Bravo and "Mr. Wrestling" Tim Woods. 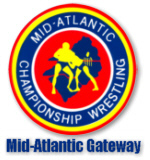 The Mid-Atlantic Tag Team Titles had been dormant for nearly two years, but were put up in a six-week television tournament after Gene and Ole Anderson left the area. November also saw the first singles titles for Greg Valentine and Rufus R. Jones, with both holding the Mid-Atlantic TV Title during this month. The Masked Superstar was being pushed as a dominating force by the promotion, and the masked man had an intriguing series of matches with Andre the Giant during the Thanksgiving holiday shows around the area. December of 1976 saw NWA Champion Terry Funk have his final major tour through the area as the NWA World Heavyweight Champion. December also saw main event stars come and go. Angelo Mosca would leave the promotion after a solid year at the top of cards, and Kim Duk and the Mighty Igor would enter the promotion. Igor, particularly, would be a major player for Jim Crockett Promotions in 1977. Two of the biggest feuds in the history of Mid-Atlantic Championship Wrestling essentially ended in December with Blackjack Mulligan taking the measure of Paul Jones (albeit in controversial fashion) for the U.S. Title, and Wahoo McDaniel topping Ric Flair for the Mid-Atlantic Heavyweight Championship. Neither Paul Jones nor Ric Flair would ever hold those respective titles again. One could easily make a case that the fourth quarter of 1976 was the most exciting and eventful three-month period for the promotion during 1976. It certainly brought to a climactic conclusion several great feuds, while at the same time generating heat and enthusiasm for new ones to blossom in the New Year. The prospects for 1977 certainly looked great, and as fate would have it, Jim Crockett Promotions would continue to flourish in the year of 1977! October of 1976 will likely always be best remember for a special night of wrestling action in the Greensboro Coliseum that occurred during that month. On October 16, 1976, the three singles titles in Jim Crockett Promotions all changed hands in Greensboro! No one could ever remember such a thing happening, and what a night it was! In the first switch on that October 16, 1976 Greensboro card, "Mr. Wrestling" Tim Woods defeated Angelo Mosca for the Mid-Atlantic TV Title. Mosca had originally beaten Woods in the finals of a tournament in April of 1976 for this title. Woods claimed Mosca had cheated him out of this title in that April encounter, so "Mr. Wrestling" exacted a measure of revenge in Greensboro. Mosca’s defeat signaled the end for him as a top star for the promotion, and he would leave the area before the end of the year, jobbing to Wahoo McDaniel in his final television appearance. Woods would not have a significant reign as TV Champion, losing the belt to Greg Valentine in about three weeks hence. Ric Flair topped Wahoo McDaniel for the Mid-Atlantic Heavyweight Title in the second title switch in Greensboro on October 16, 1976, again injuring Wahoo in the process by repeatedly ramming his back into the steel ring post. Wahoo would return to action in several weeks and these two embarked in a memorable series of matches that would wind down perhaps the greatest feud in the history of the promotion. The final title change on this October night in Greensboro saw Paul Jones upset Blackjack Mulligan for the area’s top singles title, the United States Heavyweight Championship. Mulligan had held this title for seven months without interruption, in one of the most impressive reigns of any champion during the Mid-Atlantic era. While Mulligan would go on to other stints as the U.S. Champion, Jones’ victory shattered Mulligan’s air of invincibility that he had built up during most of 1976. The Masked Superstar was extremely impressive during the month of October 1976. Managed by "Professor" Boris Malenko, Superstar immediately began getting headline matches with such stars as Wahoo McDaniel, Dino Bravo and Rufus R. Jones. During October, the Superstar issued a challenge that would be the focus of many matches in the Mid-Atlantic area for years to come. The Superstar promised to remove his mask if any wrestler could defeat him by pinfall or submission. Malenko further guaranteed to pay $5000 to anyone who could do the same. Malenko also started a ritual in October that would be the focal point of a major angle in early 1977 with the Mighty Igor, lighting up a "victory cigar" after each of the Superstar’s victories. October also saw the majority of action in a unique twelve-team tournament to crown new Mid-Atlantic Tag Team Champions. The Mid-Atlantic tag belts were put up for grabs after Gene and Ole Anderson took the NWA World Tag Team Titles out of the area, and were only making sporadic appearances for Jim Crockett Promotions. Having twelve teams compete in the tournament made for interesting brackets to say the least! Matches were held on Mid-Atlantic television every week, and when a marquee match up in late October involving Ric Flair and Greg Valentine versus Paul Jones and Rufus Jones ended up as a double disqualification, the tournament was left with only two teams to vie for the crown! The two remaining teams, Dino Bravo and "Mr. Wrestling" Tim Woods and the team of Mike "The Judge" DuBois and "Sergeant" Jacques Goulet, would battle for the Mid-Atlantic Tag Team Championship on television during the first week in November of 1976. 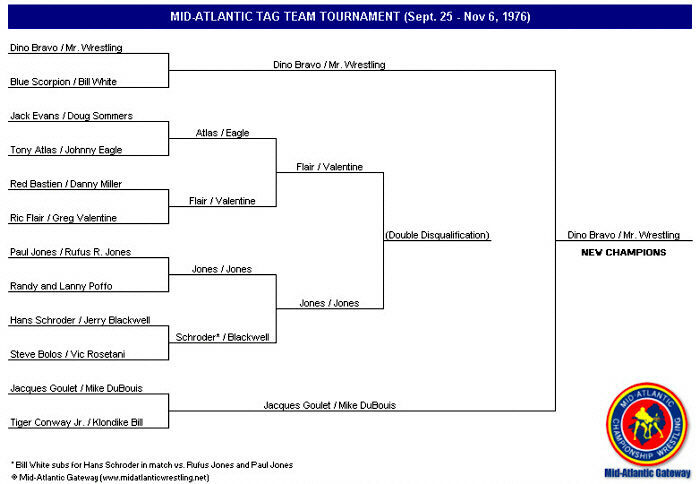 November of 1976 started off with a bang as on the first Mid-Atlantic Championship Wrestling television show of the month, Dino Bravo and "Mr. Wrestling" Tim Woods defeated Mike "The Judge" DuBois and "Sergeant" Jacques Goulet in the finals of the Mid-Atlantic Tag Team Championship tournament. Bravo and Mr. Wrestling would hold the titles through the remainder of 1976 before dropping them in January of 1977 when Mr. Wrestling left the area. TOURNAMENT BRACKETS - A Gateway Exclusive! The beginning of November also saw the first seeds sown in what would be a momentous feud between Ric Flair, and his cousins Gene and Ole Anderson. In a six-man match that aired on Wide World Wrestling, Flair slapped partner Gene Anderson because Ric said Gene was telling him how to wrestle the match. This "slap heard ‘round the world" was the catalyst of the memorable feud which would soon erupt between Flair and new partner Greg Valentine, and the NWA World Tag Team Champions Gene and Ole Anderson. Greg Valentine had a very busy month of November. On November 8, 1976 he won his first title in Jim Crockett Promotions, besting "Mr. Wrestling" Tim Woods for the Mid-Atlantic TV Title in Fayetteville, N.C. Greg would lose the belt to Rufus R. Jones at the tail end of the month. November also saw Valentine institute the $1,000.00 silver dollar challenge that his father (at this point he was saying his "brother") Johnny Valentine had made famous several years earlier. This challenge would continue for years, where Greg would offer a fish bowl full of silver dollars if any wrestler could pin him or make him submit within ten minutes in a television match. Finally, Greg injured long time fan favorite Johnny Weaver in a televised November match. Weaver was out of action for about four months, and he and Valentine had a short program against each other when Weaver returned in early 1977. The Masked Superstar continued to dominate foes in an impressive string of victories in the month of November. Superstar had an amazing clothesline maneuver, and his cobra submission hold was lethal. Andre the Giant was brought in by the promotion in late November to test the Superstar and his rapidly growing reputation of being unbeatable and invincible. The matches between Superstar and Andre were inconclusive, but the mere fact that even Andre the Giant couldn’t beat and unmask this masked man just added to Superstar’s growing legend. Blackjack Mulligan ended November on a positive note by beating Paul Jones for the U.S. Title on November 28, 1976 in the Charlotte Coliseum. This was a clean win by Mulligan over Jones in a rare two out of three falls match. This match also marked the high water mark for Mulligan as the United States Champion. While Mulligan would hold this title for much of 1977 and a portion of 1978, his future reigns were not defined by dominance as had previously been the case, but instead were clouded by controversy. The first such controversy was waiting just two weeks down the road. December of 1976 started with a sweep through the area by the NWA World’s Heavyweight Champion, Terry Funk. His principal defenses were against Paul Jones. This would be Funk’s last major swing through the Mid-Atlantic area as the World Champion, before giving way to Harley Race in early 1977. Funk appeared in the Mid-Atlantic area often during 1976, and gave fans in the area a wealth of great championship bouts during his reign as the NWA king. In addition to his title matches against Funk, Paul Jones had an incident with Blackjack Mulligan that made it a December to remember for him, if not in a very positive way. Jones defeated Blackjack Mulligan for the U.S. Title in the middle of the month, and appeared ready to settle in for another solid reign as U.S. Champion. However, on the Mid-Atlantic Championship Wrestling TV program that was taped on December 15, 1976 (airing on December 18, 1976) Mulligan pulled a rabbit out of his hat. Blackjack told the TV audience that he had filed an official protest of the match where Jones had defeated him days earlier with NWA President Eddie Graham. Graham and the Board of Directors of the NWA reviewed films of the match and Graham sent the NWA’s official decision on Mulligan’s protest via videotape to the WRAL studios to be played in front of Mulligan, Jones, Jim Crockett and the entire Mid-Atlantic Championship Wrestling television viewing audience. Graham stated on the tape that while Jones did pin Mulligan, Jones’ feet were approximately six inches under the ring ropes (not on the ropes) when he captured the pinfall on Blackjack. Graham thus invalidated Jones’ victory on highly technical grounds, saying in effect that the referee should have broken up the pinning combination when Jones’ feet were barely under the ropes. After hearing Graham’s decision on tape, Jim Crockett reluctantly forced Jones to physically hand the U.S. belt over to the gloating Mulligan. Jones went berserk, taking out his anger on his opponent for the TV show, Lanny Poffo. Jones never really recovered from this episode, and never held the U.S. belt again despite being in the area for most of the next ten years. Mulligan would again attempt to use NWA President Eddie Graham as a crutch in July of 1977 when he lost the U.S. belt to Bobo Brazil and attempted to have Graham reverse the decision via another TV videotape. This time Graham sided with Brazil, sending Mulligan into the same type of frenzy that Jones experienced in December of 1976! The fourth quarter of 1976 saw a great deal of talent movement at all levels of the promotion. December saw its share of major movements in that regard. Angelo Mosca left the area after a solid year as a main event star. Mosca’s last TV match was a clean loss to Wahoo McDaniel who was his first program opponent when he entered the promotion in late 1975. Newcomers in December included the Mighty Igor and Kim Duk. Igor was a powerhouse who would be a main event star throughout 1977. Igor’s primary feud was against the Masked Superstar. Kim Duk would team with Superstar for the first part of 1977, and had a brief program against Wahoo McDaniel over the Mid-Atlantic Title in the early months of 1977. The last week of December saw two huge title changes. In the first, Ric Flair and Greg Valentine defeated Gene and Ole Anderson on December 26, 1976 in the Greensboro Coliseum for the NWA World’s Tag Team Championship. The Flair/Valentine combination was an awesome one, and they would battle on even terms with the Anderson’s for the World Titles during much of 1977. The next night in Richmond, Virginia at the Richmond Coliseum, Wahoo McDaniel defeated Ric Flair for the Mid-Atlantic Heavyweight Championship. Prior to this match, Wahoo vowed to never wrestle in Richmond again if he didn’t win the title from Ric. Flair would never hold the Mid-Atlantic title again after this night. And while he and Wahoo would wrestle many more times over the years, this match effectively ended their greatest feud over the Mid-Atlantic Title that started in the middle of 1975 and lasted until the final days of 1976. The final three months of 1976 were a fitting way to end what was an outstanding year of wrestling put on by Jim Crockett Promotions. The fourth quarter had it all---major titles changing, promising newcomers to the area, controversial finishes, ends to great feuds and the beginnings of great new feuds. But as good as 1976 was, there was promise that 1977 could be even better! MASKED SUPERSTAR—Superstar put $5,000.00 and his mask on the line to any wrestler who could beat him by pinfall or submission in a singles match. There were a lot of comers in the last three months of 1976 for this challenge, but no one could pull it off and defeat the masked man. Superstar had an impressive list of victims, and he and his manager "Professor "Boris Malenko formed quite an imposing duo. At the end of December 1976, Kim Duk joined with Superstar and Malenko creating the Malenko "family" that would cause havoc in Jim Crockett Promotions during the early months of 1977. GREG VALENTINE---Valentine won his first singles title in Jim Crockett Promotions, the Mid-Atlantic TV Title, in November 1976. He became one half of the NWA World Tag Team Champions with Ric Flair in December 1976. Greg also instituted his famous $1,000.00 silver dollar challenge during the fourth quarter of 1976. And perhaps what pleased the sadistic Valentine the most during this time frame was that he injured fan favorite Johnny Weaver, putting Weaver out of action for four months. Without question, an eventful three months for the "Bionic Elbow." RIC FLAIR---The "Nature Boy" defeated Wahoo McDaniel for the Mid-Atlantic Title on October 16, 1976 in Greensboro, and had many outstanding bouts against Wahoo during the fourth quarter. Ric won his first World’s title this quarter, teaming with buddy Greg Valentine to defeat his "cousins" and fellow heels, Gene and Ole Anderson. The last three months of 1976 were undoubtedly the best for Ric in 1976, truly a breakout year for the rising superstar. ANGELO MOSCA---"Big Nasty" lost his Mid-Atlantic TV Title to Mr. Wrestling on October 16, 1976 in Greensboro, and never recovered. Mosca wrestled in fewer and fewer main events after this loss, and was overshadowed by newcomers Greg Valentine and the Masked Superstar on the heel side of Jim Crockett’s roster. Mosca left the Mid-Atlantic area completely in December of 1976, losing his last television match cleanly to Wahoo McDaniel. Ironically, McDaniel was Mosca’s first big name opponent when Angelo entered the area almost exactly a year earlier in matches promoted as battles between the ex-football stars. JOHNNY WEAVER---The ever-popular Weaver suffered an embarrassing loss and injury to Greg Valentine on television, a match that put Weaver on the shelf for approximately four months. This match helped put over Valentine as a true "crippler," while at the same time diminishing the legend of Weaver who was unable to break out of the mid-card ranks for the most part. Weaver did make a comeback in early 1977 and attempted to exact revenge from Valentine for this injury, but was unable to make much headway against the younger, stronger Valentine. "SERGEANT" JACQUES GOULET---The Sergeant formed a solid mid-card tag team with Mike "The Judge" DuBois for most of the year 1976. When that duo lost to Dino Bravo and Mr. Wrestling in the finals of the Mid-Atlantic Tag Team Title tournament in early November 1976, it effectively spelled the end for this twosome as a competitive tag team. Goulet started wrestling by himself, and the results were not good for him. His won-loss record started to slip noticeably, and it appeared that any kind of run as a singles competitor was not in the offing.